Mix the marinade ingredients and pour over the wings. Allow to sit at least an hour but as long as overnight. Bring frying oil to 350°F. While the oil is coming to temperature, take the wings out of the marinade and place them onto a paper towel to dry. Sprinkle with the rice flour. 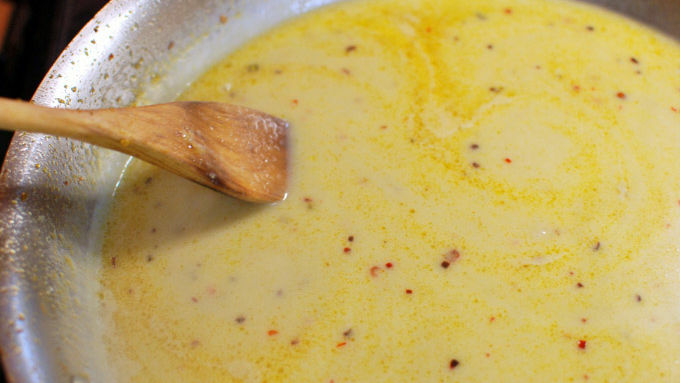 To make the sauce, begin by cooking the Thai chilies in a little oil for 2 minutes. Add the curry paste and cook 2 minutes while stirring. Add in the coconut milk, fish sauce, sugar and juice of 1 lime, and bring to a simmer. Lightly simmer, stirring often until it reduces by about half. Remove from heat. 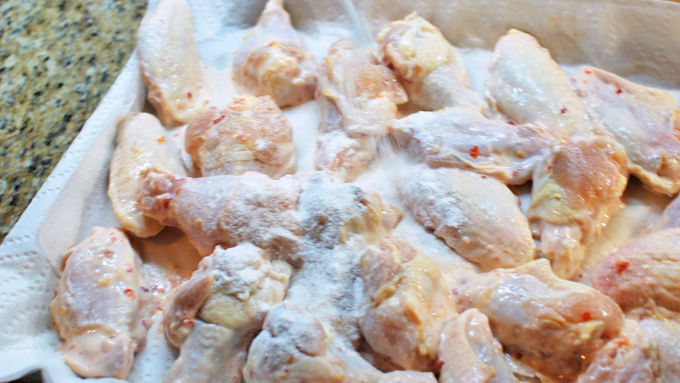 Toss the wings so they’re evenly covered with a light coating of the rice flour, adding a little more if needed. Shake off any excess flour. Fry the wings in 3 batches for about 8-10 minutes until golden brown. Drain for about 30 seconds and then add directly to the sauce. Stir to coat. 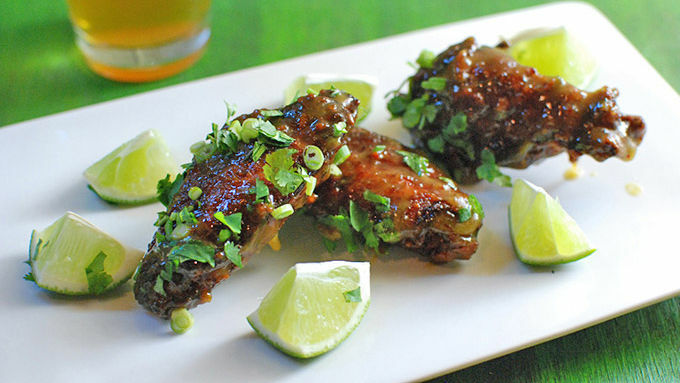 Place the wings on a platter and top with the cilantro, scallion and lime. 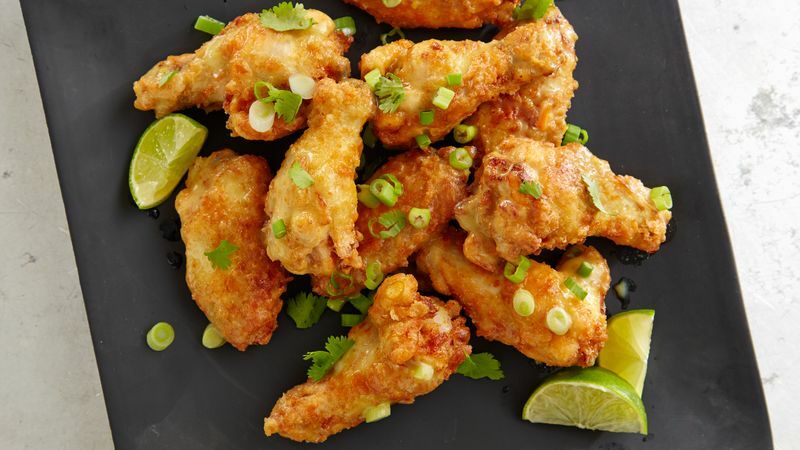 These sweet and spicy chicken wings make a great snack or easy dinner. 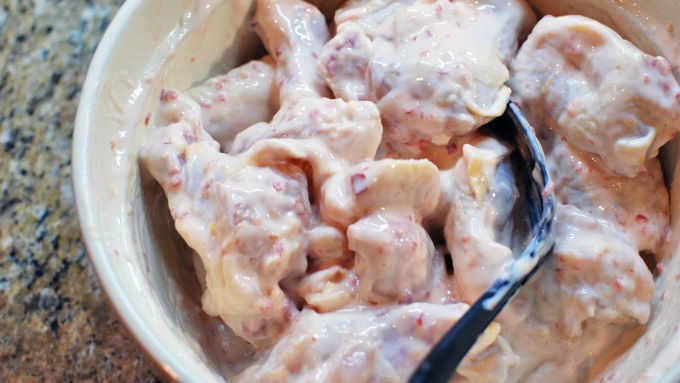 These sweet and spicy chicken wings make a great snack or easy dinner. We all love wings for the big game, but it's fun to do something different than the normal buffalo wings from time to time. With the football season past us, I get burnt out on wings by March Madness and I'm looking for something new to do with them! These Green Coconut Curry Hot Wings are just what the doctor ordered for a new and different type of wing. I've tried a lot of twists on chicken wings and this one is by far the best I have come up with. The problem with making wing sauces is that you need to make sure there is enough sugar and fat to help the sauce stick tightly to the fried wings. This one fits the bill perfectly with a bit of sugar to add that sticky quality, and plenty of coconut to add that fatty richness. 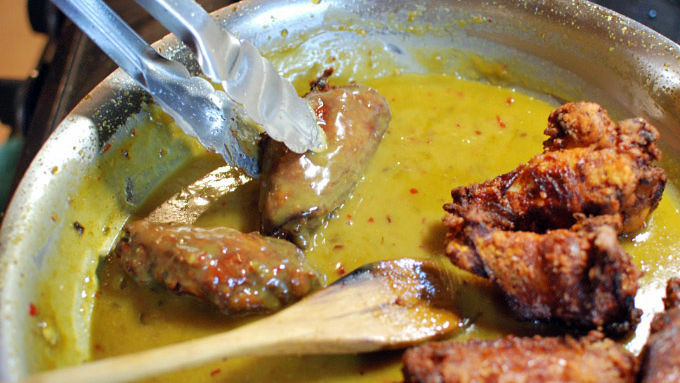 If you want to make these wings nice and hot, add a few Thai chilies to the pan just before adding the curry paste. These wings are sweet, sour, savory and spicy. Not to mention the perfect amount of saucy – you won’t even need a dipping sauce. That’s why these wings are the perfect treat for any game day.